Jeremiah Panhorst (@jpanhorst) is away this week nursing a buckshot wound, but Josh Wigler(@roundhoward) and Antonio Mazzaro (@acmazzaro) are holding down the fort investigating the curious case of Vinci city manager Ben Caspere and the shotgun-toting Birdman. 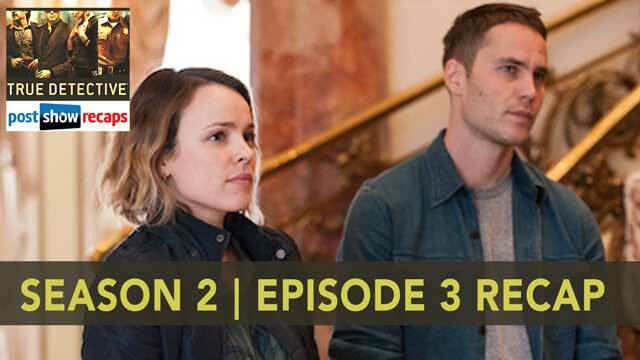 Josh and Antonio run down all the latest clues the show has dropped about the murder mystery, and they dig deeper into some of the new character revelations, including Ray Velcoro’s haunting dream, Paul Woodrugh’s romantic past, Frank Semyon’s bareknuckled brawl, and Ani Bezzerides’ interest in animal masks. Let us know your take on this week’s episode in the comments below or by hitting us up through the feedback form.